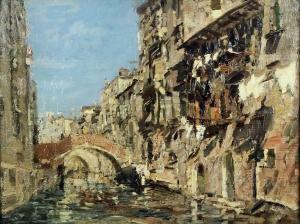 Find artworks, auction results, sale prices and pictures of Emma Ciardi at auctions worldwide. 38 by 50.5cm., 15 by 20in. Much the same today, the view in the present work looks across the Piazza San Giovanni, also called the Campo delle meraviglie (square of the marvels), with Verocchio\’\’\’\’s equestrian sculpture of the condottiero Bartolomeo Colleoni visible in the centre. Testament to Ciardi\’\’\’\’s popularity in Britain, the work was exhibited in the artist\’\’\’\’s lifetime at the Fine Arts Society in London in 1928, where it was acquired by the British collector in whose family the work has remained until now. We are grateful to Myriam Zerbi for confirming the authenticity of this work on the basis of the original. Emma Ciardi received her early training under her father Guglielmo (1842-1917) and collaborated with her brother Beppe (1875-1932). Extremely talented, she was able to work completely independently, disregarding critical opinions. Ciardi\’\’\’\’s association with the French Impressionists enhanced her reputation and her works were highly sought after by collectors on both sides of the Atlantic. She also exhibited regularly at the Leicester Galleries in London, at the London Fine Arts Society, and at the Howard Young Gallery in New York. 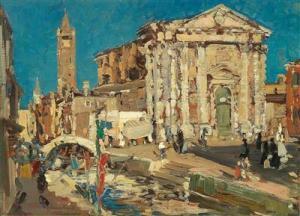 The contemporary press described her as a painter of European fame. She was one of the very few women artists whose name was linked with female Impressionist artists including Mary Cassatt, Suzanne Valadon and Marie Laurencin. English, Italian and American collectors regarded Ciardi\’\’\’\’s work as a valuable link between the 18th century Venetian tradition and the new visual imagery of the Macchiaioli and the Impressionists. As well as exhibiting in London, Emma Ciardi spent lengthy periods of time in Kent as a guest of Sir Edmund Davis, a collector, friend and her British agent. Sir Edmund and his wife were both accomplished artists and connoisseurs. They became patrons of the arts and amassed an overwhelming collection which including paintings by some of the finest artists. 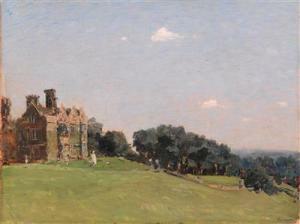 She contributed to a series of works in oil depicting Chilham Castle in Kent, Sir Edmund\’\’\’\’s home (lot 1132). Inspired by French plein air painters, her works directly reflect her observations of nature. 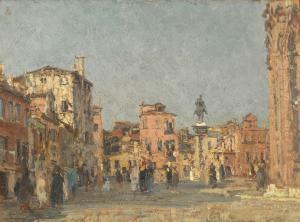 Nelson\’\’\’\’s Column (lot 1135) is another charming plein air painting. 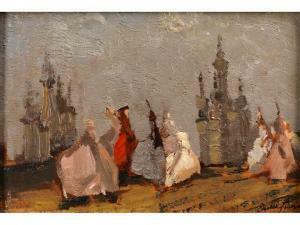 A lively souvenir of London and a view of Paris (lot 1133), and another view of a village in England (lot 1134). This group of works reflect the charm and strength of her personality.